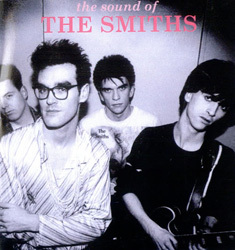 "The Sound Of The Smiths"
Besides the three bonus tracks mentioned above, iTunes UK customers who pre-ordered the deluxe edition of the album also received the video for "Stop Me If You Think You've Heard This One Before". 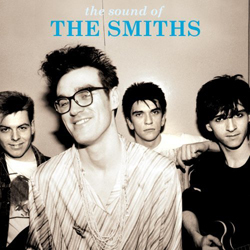 Cover photo by Tom Sheehan, different variations for each format. For the 2-cd format, the digipak artwork is slightly cropped comparatively to the jewel case artwork. 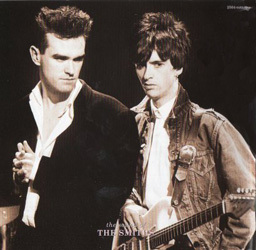 The original photo was edited to get the band members closer together. 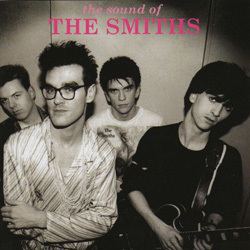 This album's artwork was supervised by Morrissey. 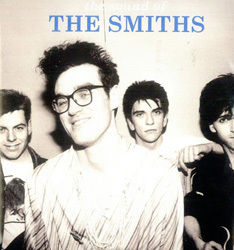 UK: A promo 2-cd set in clear plastic envelope was sent to media in the weeks preceding the release of this compilation. 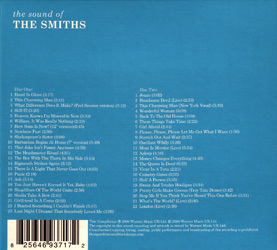 It came with two inserts showing the (slightly cropped) artwork of each edition on the front and the track listing of each disc on the back. 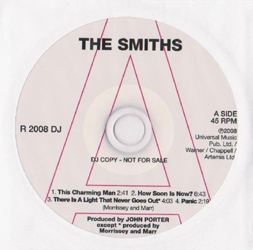 A 4-track promo cd featuring the songs "This Charming Man", "How Soon Is Now? 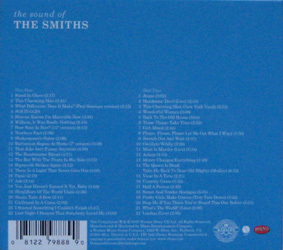 ", "There Is A Light That Never Goes Out" and "Panic" also served to promote this release (Rhino R2008DJ; view left). This is the same cd which was given away to the first buyers of the "Singles Box", but in this case a promo/plugger sticker was added to the back of the paper envelope. 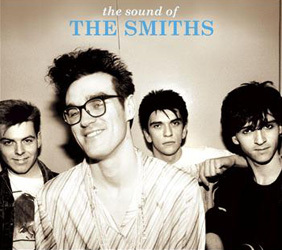 Argentina: The release of this album was promoted with the distribution of the 1-disc edition of the album with a black Warner "Disco Promocional Prohibida Su Venta" stamp or print on the disc. 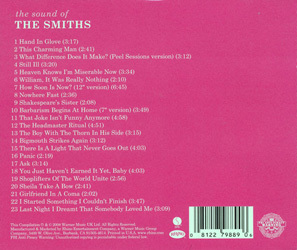 USA: A promotional 2-cd set with no front artwork was distributed to media at the time of release of the album. 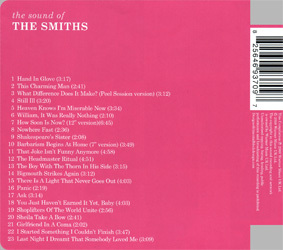 The track listings and credits were found on the red back insert (view from left menu). 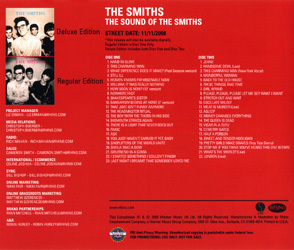 Stock copies of the 1-cd edition with a hole punched out of the barcode and a gold promo stamp on the back of the booklet also served as promos.